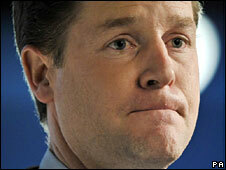 Head teachers have been asked to "raise their game" as part of a £2.5bn funding deal proposed by the Liberal Democrats. Party leader Nick Clegg called on schools to reinvent the curriculum, raise results and close the attainment between rich and poor. He told the Association of School and College Leaders conference: "We will find you extra funding, even while elsewhere there are cuts." In return, the "greatest expectations" will be placed upon them, he said. The Liberal Democrats are proposing a pupil premium through which an average of £2,500 would be attached to each pupil from disadvantaged backgrounds and go directly to the school they attend. The Conservatives propose a similar scheme, but would use money already in education budgets to fund it. A report by the Institute of Fiscal Studies earlier this week suggested that pupil premium schemes would lead to budget cuts in a significant minority of schools unless extra money was attached. Currently, schools get cash for deprivation levels that reflect the overall make-up of their local authority area rather than within the school. Mr Clegg told the London conference he wanted Britain to be a place "where it is no longer possible, on a pupil's first day of school, to predict how well they'll do simply by asking them how much their parents earn". "So, a deal between government and schools: Money and freedom in return for high expectations and more ambition. "We will give a level of freedom you haven't known for decades. But, in return, we will place the greatest expectations on you any government ever has. "One - we will expect you to transform the curriculum, so that it is rich, relevant and stretches the brightest pupils while elevating those who struggle. Two - we will be much more ambitious about the number of young men and women leaving school with good results. "Three - we will expect you to close the gap between poorer children and their wealthier classmates. A gap which entrenches inequality in Britain today."